I know I have told you the stuff is leaving our home at a rapid pace, but I think this item deserves its own post. Our Grace has left us for a new home. 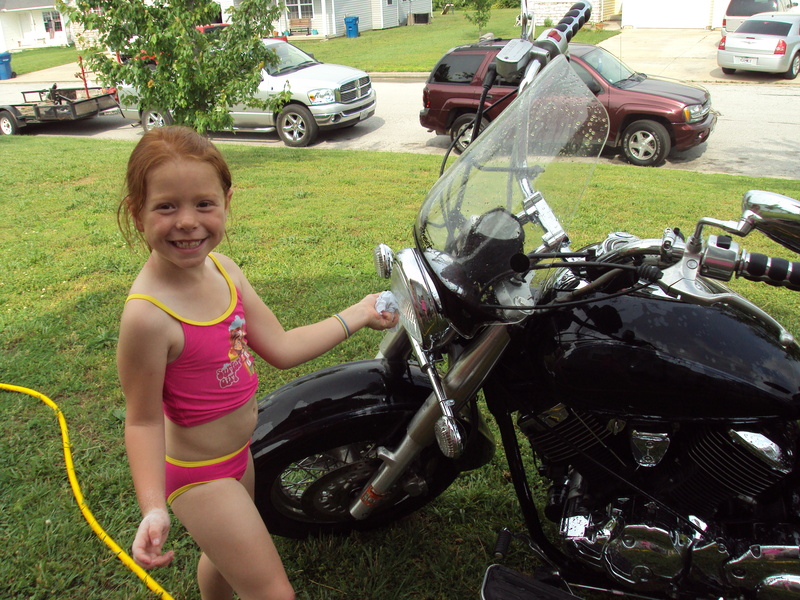 Grace is a 2002 Yamaha V-Star 1100…..but, she is so much more than that. She was Jason’s first ever motorcycle. We bought her when Elise was a baby, and it seems like just yesterday Elise could actually ride behind Daddy, because she had just grown big enough to reach the foot-pegs. Also our Kenna Joy was a biker chic! I remember her first ride in the rain. She came off the back of Grace all soak and wet and said “A biker chic’s gotta do what a biker chic’s gotta do!” She was 8. We laughed so hard. I remember following Jason and Kenna home one night; them on Grace and me in the truck. I saw Kenna’s little body fall asleep as she hugged her daddy close. So sweet. Jason and my Dad (Ken K) took long trips together on their bikes. Grace and Betty were a great team. They made it out to Sun City, Kansas and over to Kentucky and Tennessee together. I think they saw the world’s deepest well or something on their trip, I don’t know……..I do know there was male bonding time and wonderful memories on the open road! The name Grace came from me telling Jason “by the grace of God you will not get hurt on her”, and he never did, thank you Lord. We loved Grace and she will be missed! Here is my Ode to Grace. Who rode you, oh wonderful Yamaha! You will be missed our Grace girl! Okay maybe a little corny. That is what I am, a little corny. Just wait to see what I come up with when we place the dogs in a new home!! !